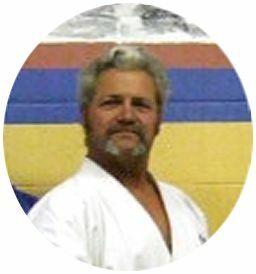 Hanshi Gary was born in 1956 in Greenville, MS. He was raised on Air Force Bases in England and the U.S., as his father was a jet fighter instructor pilot. As a child he was encouraged to stick up for himself, and this got him into quite a few scrapes. At the age of seven he moved with his family to Lakenheath, England. It was in Lakenheath that he was first introduced to the martial arts through Judo. Unfortunately he cannot remember his instructor's name. By the age of 11 he returned to the U.S. He spent the next few years working with his father in farming, and going to school. Hanshi Gary obtained his student pilot license at 13 and spent many hours flying under his fathers instruction starting with the 1946 luscombe and moving up to executive planes and an Air Force T-34. Also by the age of 13 he was operating his own custom hay farming business in Glendale, AZ, and at the age of 15 he was the foreman of his father's construction crew. Hard work and long days were the rule. During his middle school and high school years he trained and competed on the wrestling teams, and tennis team. In his early twenties he trained and fought in amateur light heavy weight boxing. As a young man he was developing quite a history of brawling and street fighting and his energy needed to be harnessed. The next twenty years of life found Hanshi pursuing a career in Design Engineering and problem solving in the industrial pump industry. In 1996 Hanshi began training in Shinpu-ren under Sensei Drake Sass of Morningstar Karate in Wickenburg, Arizona. Hanshi had enrolled his children with Sensei Sass, and felt this might be a good way for him to get back into shape and have some fun with his kids. By the time Hanshi reached intermediate rank he had been officially promoted as Sempai to Sensei Sass. Hanshi trained and helped teach three classes a day six days a week in the primary and secondary dojo's of his instructor. In 1998 he was allowed by the head of the Shinpu-ren system to open his own school, and allowed to teach within the scope of his rank and knowledge. Daily, Hanshi Gary would spend hours analyzing and interpreting all of the concepts and bunkai to the forms and defense he was teaching and learning and every day he would gain increased understanding of the mechanics and science behind his chosen martial art. By the time he had his black belt rank he had also studied with numerous other instructors and masters in many other systems. In particular Moo Duk Kwan Tae Kwan Do, Roman Greco Wrestling, Uechi Ryu Karate, Shotokan Karate. In 2000 and 2001 Hanshi was awarded Instructor of the year in Shinpu-ren. In 2003 Hanshi opened his second school in Prescott, Arizona. This school produced many talented and accomplished students of Shinpu-ren including multiple world champions. Hanshi himself has earned a lengthy and respectable competition record. It was also at this time that Hanshi parted ways with Mr. Sass, as the training in the Wickenburg School had changed systems and Shinpu-ren was no longer the primary system being taught. Over the next four years Hanshi would learn from masters in Shuri Ryu, Kyoshi Raphael Merle 8th degree, Kemscrimadoh, Sifu Glen Abresci 10th degree founder, and humane pressure points George Dillman's method, grand Master Sterling Johnson. Hanshi now runs all of the classes out of one Dojo in Prescott Valley, Arizona. There are four primary instructors and one certified Sempai.